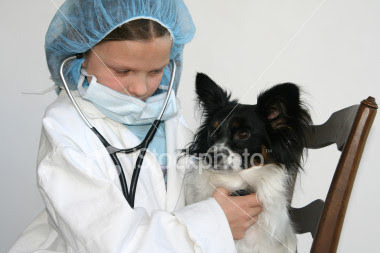 Dr Liz... the vet from Russell Vale Animal Clinic: Musings of Dr Liz - It's just a virus, says the doctor. Musings of Dr Liz - It's just a virus, says the doctor. just feeling off, lethargic, not wanting to move much, and with the typical cold signs. I know what the doctor will say - its just a virus, go to bed, drink lots of fluids. Sleep. You'll be fine. Now, that last line made me think about what I say to a loving pet owner, who brings their pet in with similar signs - a bit off, not themselves, didn't eat well that morning (or night before). I wouldn't say " You have a virus, go to bed, drink lots of fluids, you'll be fine!" Leo taking Dr's advice and going to bed! I admit to being a bit disgruntled when I am told that by my GP, as really, I don't go to see him often, and so, in my view, when I do go, it is because I do feel really unwell, and I want him to help me feel better. I can only imagine that a loving pet owner would feel the same way too - after all, we hate the thought of our pet being in pain, or being lethargic and unwell. As a vet, I work on a theory that if our pets are unwell enough for us to notice that they are unwell, then they are seriously and truly unwell. Now I do know some pets do pretend to be unwell - for example - they pretend to limp when you are watching, but walk perfectly fine when they think you aren't, but this not as common as you may think. Do our pets get "viruses" like us? You bet they do. Can they feel lethargic as a result? Sure, of course they can. Do they need to see the vet every time you think they are unwell? Not always, but how do you as the loving pet owner know when it is OK to wait and see? Even vets get that wrong sometimes (as do doctors - we all know stories of people being sent home from hospital only to get worse shortly after). Would you prefer that I say "your pet is ok" without a check up or any tests? - Most times I would be right, but what if I was wrong, which is possible some of the time. Or would you prefer that I say that "Our check up of your pet, (plus the test results), tells us that your pet will be fine" and we would be right 100% of the time. 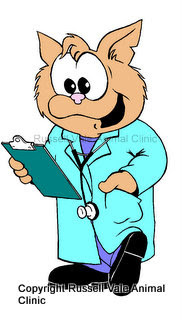 And in those pets where the check up shows up something abnormal, we can act on it straight away and get things fixed. I know which score I would like as a vet - which is 100%. Rather than take the chance of being right a huge chunk of the time, as an intelligent guestimate. At the end of the day, the ball is in the hands of the loving pet owner, as I can't drag your pet into the vet - only you can do that. As I sneeze myself into another box of tissues, I'll have to content myself with the doctors advice, and head off to bed with lots of fluids and a big box of tissues. And hope that this time, my own GP is right! I am Dr Liz, and I wish you all good health. Bring Spring On!